It was Spring Cleaning Weekend at our house this past weekend. Yes, I realize it is fall and that we are clearly way behind schedule. We took my bike in for a tune up. We bought bookshelves and brought up five enormous containers of books up from our basement (we packed our books away shortly after Miguel was born when I had a fit about clutter). We went through all of the books and filled two enormous containers with books to be donated and put the remaining books on the new shelves (organized by language, theme and/or author, of course). We had our children try on all of their pants and long sleeved shirts (you can probably imagine how much they enjoyed this little family activity) and now have three bags of clothing to donate. We bought a new television and are going to donate our old one (I know that getting a new television is not actually part of a cleaning routine by any stretch of the imagination but it is exciting nonetheless and involved a lot of effort on our part because, my goodness, televisions have gotten much fancier and more difficult to hook up than in days of old). We cleaned the car seats (and by "we" I mean Luisa since I do not understand the inner workings of car seats). Miguel collects things in the cup holders in his booster and, when the booster gets moved, the little treasures disappear into the car seat innards. So, Luisa had to turn the car seat over and shake it for 15 minutes to get everything out. 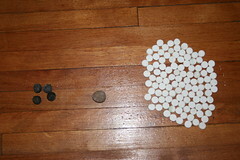 The fruits of her labor: four unidentified seeds, a rock and one hundred and eleven Altoid mints. Yes, I counted and am not even exaggerating. For those of you who are going to look at that picture and count the Altoids to make sure, one Altoid is not pictured. After the picture was taken, I found a lone mint a few feet away. Those suckers really roll. That's the weekend wrap-up. I promise more interesting posts in the near future though I'm not sure I can top showing you the contents of my child's car seat.